More thoughts on zero tolerance. Book Review: "Do not hinder them"
Never took the bus, did they? ....are amply shown in this "weight loss expert's" comment about imposing a "fat tax" on obese peoples' clothes. Apparently, this hypnotist has not only lost four stone due to hypnosis, but has also completely forgotten the experience of shopping at "big & tall" and "plus sizes" stores to realize that, due to the specialty nature of quality clothes for those of height and girth, plus the reality of extra fabric needed to cover the same, clothes for the obese are indeed more expensive than those for people of average size. Again, regarding the tragedy where a "Greek" pledge at Penn State lost his life because nobody pulled out his cell phone and called 911, it strikes me that this is an understandable consequence of our Victorian** attitudes towards drinking. First of all, other fraternity members would know instinctively that since the pledges were largely under 21, that they would be in trouble as soon as the police and ambulance were called. This is especially the case when we consider that universities are prone to revoking fraternity charters when they get news of a party. On a more basic level, the age 21 drinking age helped to kill this young man because it ensured that he learned about alcohol not from his family, but from his high school party friends and frat brothers. Ending our Victorian attitudes towards liquor might not have kept him alive, but all in all, it would be more likely. **I call these attitudes "Victorian" because Prohibition was a Victorian enterprise which the beer-drinking Puritans would have been puzzled by. ...this time, from the Rio Olympics of 2016. No, I'm not talking about the millions of tons of concrete, steel, and plastic decaying in abandoned venues, but rather the fact that apparently, the "eco-friendly" medals handed out are tarnishing. Writing as a guy who's actually done work ensuring the quality of plated parts of base metal like brass, beryllium copper, and stainless steel, what's worth noting here is that the military has been using parts with such platings for decades in all climates, and it does not matter whether they are dropped or "mishandled", as the IOC's excuse reads. Rather, it simply matters that you've got a clean base metal blank treated properly and plated to a thickness of 50 microns or less. What matters is that your base metal and process is good, and it's worth noting that the weight of gold listed--0.2 ounces--is exactly the same as I'd anticipate from a 3" medal coated a little more than 50 microns thick. In other words, their "environmentally sound" recovered base metal simply wasn't capable of holding any plating, something that should have been obvious to any decent plating engineer or technician. I dare suggest that a faulty medal is no environmental win. It's a triumph as great as that of the infamous green swimming pool. Prompted by this note about a review of a book by Justin Peters, Do Not Hinder Them, I decided to purchase the book and see what Peters had to say. As I've mentioned "a time or two" on this site, the sad reality is that far too many "seeds" do not sprout, and it's something that's killing our churches. The main thrust of the book, in my view, is Peters' view of the age of accountability--the doctrine that below a certain age, all children are given grace by God whether or not they personally confess Christ. In Peters' view, that age is somewhere around the ages of ten to twelve, somewhere near the age of a Bar Mitzvah, and where Dorothy Sayers noted the "poll parrot" stage of education ends, and the "pert" age begins. In the language of classical education, it's about the age when a child can begin to use the tools of logic/dialectic. Now as a Baptist myself, I am of course quite amenable to the notion of an age of accountability. The simple fact is that infants do die occasionally, and that just as David noted that he would go to Bathsheba's child, there is some indication of grace to the child when he's that young. I can also commend the idea that there are some things the very young cannot really understand, and that the practice of thinking logically may be involved in coming to Christ. And yet....and yet....I cannot completely go along with his thesis, as his very title refers to Matthew 19:13-15, which notes that Jesus specifically says to let the little children come to Him. Not teens, not youths, but little children. Moreover, if a key issue with people falling away from Christ was age, then the Scripture might have said that specifically (it doesn't IMO), and we would not see the huge fallout from college age conversions that we do. So it is a good effort, but ultimately it is one that does not persuade me. I am 100% in agreement that revivalism and its techniques bear a lot of false fruit. I am 100% in agreement that our "evangelism light" or "easy believism" culture tends to leave people defenseless against the challenges of life--persecution, the need to grow and repent, and the like. But at the same time, I am not persuaded that our problems will be solved as we refuse to immerse the young. What would Al Capone have done with this information? Leakers (of course) have revealed that apparently the FBI investigation of ties with Russia have identified people close to Donald Trump as "persons of interest." Now apart from whether you can trust a leaker, you've got the question of what happens to the effectiveness of the FBI when employees are giving the media a play by play account of investigations. Given that almost all of these leaks are done on behalf of the Democrats, you've got to wonder if liberal "investigators" at the FBI would be just fine with every criminal in the world going free as long as the liberal narrative is preserved. Check out this graphic (H/T ShotIntheDark.info) comparing how people viewed race relations in 2009 vs. 2016. 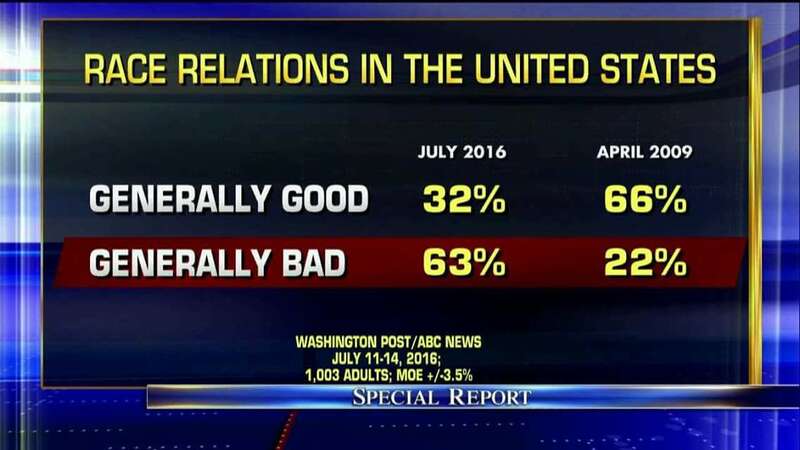 Now granted, there was probably a bit of an "era of good feelings" with the start of the Obama presidency which probably influences the data, but it is still striking that the percentage of people who felt race relations were "good" halved, and the percentage of Americans who felt race relations were "bad" nearly tripled. Keep in mind as well that this was before the election. 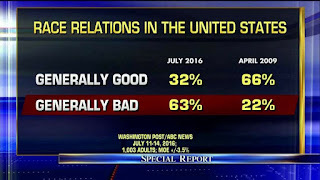 This is taken at a time when most people believed that Hilliary Clinton would be the next President. You would have thought that we'd elected Bull Connor to the Presidency in November of 2008. Here's a great column by George Will noting the economic malaise in certain industries known as "Baumol's Disease." More or less, it's where certain professions--teaching, medicine, performing arts--do not get more productive due to improved technologies. We might add "preaching" and "church work" to that as well--not too many pastors, after all, have audiences that exceed Jesus teaching the 4000 and the 5000, or even Peter's sermon to the infant church in Acts 2. Amplification, radio, the printing press, and even the Internet haven't really changed the dynamics that a man can really only serve so many people. And perhaps--fundagelical churches having tried to adopt many factory techniques over the past century, often with dismal results (rear ends in pews, but the vast majority as spectators, not players)--it's time to stop striving against "Baumol's Disease", but rather to embrace it. Don't waste time and effort trying to overcome the limitations of the profession, but rather spend that same time and effort doing it the way Peter and our Lord did. This entertaining little bit (H/T WND) suggests that by 2030, most Americans will no longer own a vehicle, and in the illustration they are suggesting that among the neutral factors are availability, comfort, and performance. As if it makes no difference that my own vehicle is sitting in my own driveway, and I get to decide how clean it is, and what type of vehicle it is. It appears that these advocates of public transit, ride sharing, and autonomous vehicles have never ridden the bus or otherwise experienced "the tragedy of the commons." Digging deeper, they are claiming that speed of travel, convenience, and safety are factors militating against AVs and transit....again, you've got to assume that they've never imagined their own vehicle sitting in front of their own home, and also (again) that they've never taken the city bus. Transit, AVs, and the like have their place, but out of touch "studies" like this really don't do their cause any favors among people who have ridden the bus. Apparently the Syrian government has not only been killing political opponents at an incredible rate for the past five years, but they may also have built a crematorium to hide the evidence. Data consistent with a crematorium include the general construction of the building and clear evidence of a lot of heat escaping from the building. I'm looking forward to the Russian, Iranian, and Syrian explanations when Nikki Haley gets a hold of the pictures and shows them to the U.N. Apparently some people are a little slow on the uptake on what "never again" means. Update: given that the U.N. World Intellectual Property Organization appears to be involved in granting the North Koreans a patent for sodium cyanide production, I'm not anticipating wonderful things from the U.N. It is, after all, the North Koreans who have supplied Syria with large amounts of chemical weapons, including this precursor to hydrogen cyanide, also known to the world as Zyklon B. ....regarding President Trump's rollback of Obama-era regulations requiring less salt, less fat, and more fruit, vegetables, and fiber in school lunches, and Mrs. Obama's rather angered response to the same. On one side, I agree wholeheartedly that we should not be happy with kids eating garbage, as Mrs. Obama notes, but on the flip side, I can't ignore the fact that if kids won't eat the Obama meals, then no good is being done--the kids are either sneaking in Snickers bars and French fries, or they're going hungry. Plus, doing things by administrative edict is appalling, Constitutionally speaking. Really, as much of a fan of the Mayo Clinic Diet as I am, getting people to follow it is not as simple as passing new regulations. You've got to create real incentives to try it and stay on it, and Mrs. Obama's program simply did not do that in the same way that my first experiences with broiled chicken breast concluded with me thinking it'd been made by Goodyear. Writing as the son of a woman who worked nearly 50 years in food service, there are simply some foods that don't work well on a steam table, and added sugar, fat, and salt are not there by accident. They do indeed enhance palatability, and hence if you're going to do healthy school lunches, the entire model--and capital spending--for the school lunch needs to change. It will quite frankly take a lot of new equipment, spices, training, and money. Parents also need a different model for diet, starting with an end to subsidies for grains and dairy, and continuing to a better model than the Obama model for healthcare, starting with limited coverage for avoidable heart disease and diabetes. As I noted in my bit about the carbon fiber bicycle, delaying or avoiding that triple bypass (and the bill) could be just the thing for persuading a guy to try that salad. My overall opinion is that it was long overdue, as Comey's handling of Hilliary Clinton's criminality simply does not pass muster for even a rookie detective. He convened no grand jury, issued no subpoenas, failed to get the hardware for months, allowed interviewees to share lawyers (allowing collaboration), allowed the destruction of evidence, and even swore those involved in the investigation to silence. It strikes me that any competent President of either party would have let him go a long time ago, and the real scandal here is not that he was let go now. It is that he wasn't let go last July by President Obama, or....perhaps much earlier. Here is a link that details a bunch of FBI scandals....but contrary to the title, some of them are not on Comey's watch. Rather, former FBI chief Mueller and Eric Holder appear to have abused the private jets available to them, Mueller totally bobbled the cases of Nidal Hassan, the Tsarnaev brothers, and the NSA scandals. If you look at the careers of Louis Freeh, Robert Mueller, and William Sessions, you're going to find any number of high profile cases where the FBI didn't exactly cover themselves in glory--missing evidence, destroyed evidence, doctored evidence, abuse of private jet privileges, and the like. In other words, the rot is deep in the FBI as elsewhere in DC, and getting rid of it is going to take some work. I just hope and pray that President Trump takes this responsibility seriously instead of once again sweeping things under the rug. When you see a criminally or medically critical situation, such as an extremely intoxicated young person falling down the stairs and becoming unconscious, reach into your pocket, pull out your cell phone, and call 911. Do not wait for someone else to do it. Related protocol; if someone demands you drink heavily as a condition of membership in their club, it's not a club worth joining. Honestly, how many dozen people with a cell phone in their pocket refused to make that call? The degree to which people look past situations like this these days is just disheartening. First, I got a call from my daughter yesterday: "Daddy, where is your blowtorch, and can I borrow it?" I'll be teaching her how to use it safely soon! Next, regarding the furor of some "comedian's" comments about the President, lost is the principle that, ahem, a holster is where you put your gun when you aren't using it. So the word picture he was trying to draw....makes absolutely no sense. He succeeded in being vulgar, I guess.